Anjana Susarla earned an undergraduate degree in Mechanical Engineering from the Indian Institute of Technology, Chennai; a graduate degree in Business Administration from the Indian Institute of Management, Calcutta; and Ph.D. in Information Systems from the University of Texas at Austin. Before attending graduate school, she worked in Enterprise Resource Planning (ERP) consulting. Her research interests include the economics of information systems, social media analytics and the economics of artificial intelligence. 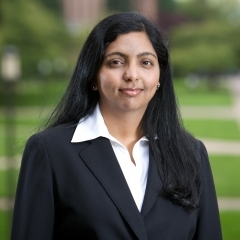 Her work has appeared in several academic journals and peer-reviewed conferences such as Academy of Management Conference, IEEE Computer, Conference on Knowledge Discovery and Data Mining, Information Systems Research, International Conference in Information Systems, Journal of Management Information Systems, Management Science and MIS Quarterly. She has served on and serves on the editorial boards of Electronic Commerce Research and Applications, Information Systems Research, MIS Quarterly and the Journal of Database Management. Anjana Susarla has been a recipient of the William S. Livingston Award for Outstanding Graduate Students at the University of Texas, a Steven Schrader Best Paper Finalist at the Academy of Management, the Association of Information Systems Best Publication Award, a Runner-Up for Information Systems Research Best Published Paper Award 2012 and the Microsoft Prize by the International Network of Social Networks Analysis Sunbelt Conference. She has worked in consulting and led experiential projects with several companies. Her op-eds and work have been quoted in several media outlets such as the Associated Press, Newsweek, The Conversation, Fast Company, Sirius XM, World Economic Forum, Quartz, Chicago Tribune, Salon, Pew Research and the Nieman Lab. She has also been a speaker at public forums such as the SXSW and the United States Institute of Peace. Cyber Monday shows the importance of mobile commerce as customers switch to more mobile devices.